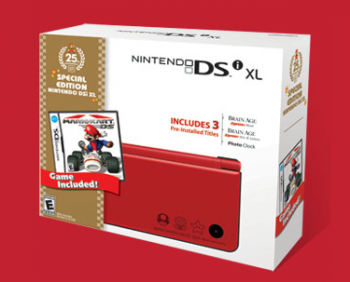 Now we North Americans can celebrate Mario's 25th Birthday by buying a red Wii or DS XL for someone we love. We knew it was only a matter of time. Last week, we heard that Europe was getting the shiny red bundles later in October and that Japan's is due out November 11th. But now, Nintendo has revealed a bundle for the Wii and DSi XL for North America which is slightly different than those other bundles. 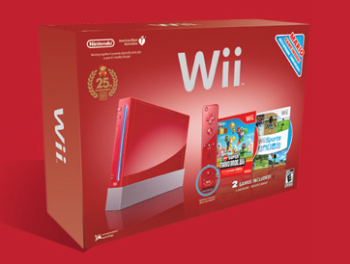 Available on November 7th, the red Wii comes with the original Super Mario Bros., New Super Mario Bros. Wii and a new red Wii Remote Plus plus Wii Sports and a red Nunchuk. All that for $199. How can you go wrong? The DSi XL package is not only red, but has an adorable series of graphics on the front including the mushroom, flower and star power-ups. It comes bundled with Mario Kart DS, as well as Brain Age Express: Arts & Letters, Brain Age Express: Math and Photo Clock all preloaded on it. This package costs $179.